Visit Better World Books online at BetterWorldBooks.com for all your new and used books. 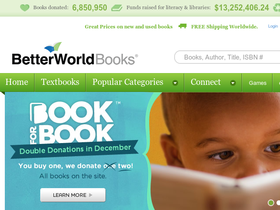 Better World Books collects and sells books online to fund literacy initiatives worldwide. With more than two million new and used titles in stock, they’re a self-sustaining, triple-bottom-line company that helps create social, economic and environmental improvement. Help their mission to create a better world one book at a time. Save money on your next book purchase from BetterWorldBooks.com with BetterWorldBooks discounts, BetterWorldBooks coupons, BetterWorldBooks promotions and BetterWorldBooks savings found here on 58Coupons.com. BetterWorldBooks.com is now offering 4 books for just $12 in their Bargain Bin Blowout. Click link to shop. Click this link and get free shipping on your order from Better World Books! Hurry on over to BetterWorldBooks to save $5 with this coupon code. This is a limited time offer. Check out BetterWorldBooks.com and save 10% off your order with this coupon code. Click link to save. Sell your used books back to BetterWorldBooks.com for Free with no shipping costs and instant quotes. Click link for details.